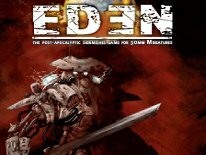 Here is another independent developer that I've discovered, which offers some interesting, and unique wargaming products. Ganesha Games is from Italy, and the company is owned and operated by Andea Sfiligoi, who not only creates the games, but also illustrates most of the books. Song of Blades and Heroes was Ganesha's first game, which was nominated in 2008 for an Origins Award in the Best Miniatures Rules category. 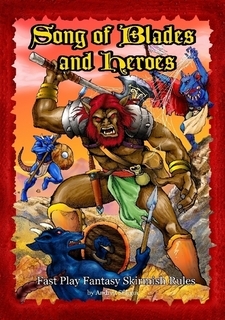 Song of Blades and Heroes is a fantasy genre skirmish game. The book is only 34 pages, and comes in .pdf format, and also as a printed manual through Lulu. I'm reviewing the hard-copy version. This isn't a scale specific game, aside from the fact it's designed to utilize 15mm or 25/28mm scale figures. Depending which scale you use, will determine the playing surface. For 15mm it's 2ft X 2ft, if you opt for 25/28mm it's a 3ft x 3ft area. The measuring in the game is done in MM, not inches, but some simple conversions to inches can easily be made. The game is also adaptable for hex-based play too, with rules for how to accomplish this. As a departure from rulers, there are three sticks utilized to determine all of the measuring in this game, and they are called Short, Medium and Long Range. For 15mm games it's 50mm, 80mm and 120 mm, and for 25/28mm it's 75mm, 120mm and 180mm. You're told to make three measuring sticks from what ever, cardboard, balsa-wood, etc, with those measurements. I opted for the 25/28mm scale, so I made one stick for Short Range at 3-inches (75mm), one stick for Medium Range at 5-inches (120mm), and the last stick for Long Range was created at 7-inches (180mm). Aside from those three sticks, the only other items that you need to play are 3 D6 dice, and the miniatures of your choosing. Terrain is also suggested, but cut outs, or even books, and household items would work as placeholder. This game doesn't have a miniatures line, so you can utilize any of the appropriate scale minis that you might have on-hand. Each character utilizes only a few very basic stats Points, Quality, Combat and Special Abilities. Points is how many points it costs to use that character. Quality is the main stat used to roll against for actions. Combat is the stat you add to a D6 roll when conducting Melee/Ranged Combat, and Special Abilities would cover any Special Abilities that the character may have. That's pretty much it. There are a list of modifiers for combat, but it's not a terribly long list. It doesn't get much more complex than that. Actually the Special Abilities is what really begins to define the characters, and adds a few more modifiers, or abilities to keep track of, but for the most part you're dealing with the Quality score when rolling for actions, and the Combat score to handle combat. Right away most will notice, that there's no movement stat, this is because all characters are considered to have Medium Movement, unless a Special Ability says otherwise, as some can move slower, some even faster. The sequence of play requires an Initiative roll at the start of the game, which will decide who goes first. After that each player upon activating rolls 1, 2 or 3 D6 dice, this will now determine how many actions that character has for the turn. The results of the roll are then compared to the Quality stat of the character activating. Results are passing if they meet or exceed the Quality stat. Quality 2-6 are the values one could have, and the best characters have lower Quality values. For example...I roll the dice, and I end up with a roll of 4, 1 and 3. My Quality stat is a 3. Via those results I now have two actions to utilize on my turn. However, if you fail with two dice, or more when you roll, then the turn automatically is passed to the other player. 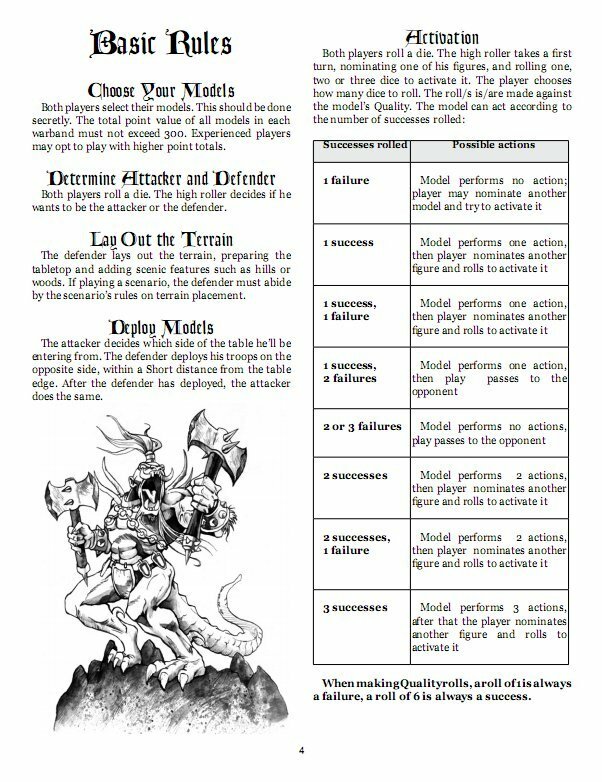 Therefore the tactical choice is do I risk rolling 2-3 D6 to earn more actions per character, or do I play it safe and roll 1 D6 per activation roll so that I can't loose my turn. If you opt to do the later and play it safe, your opponent will no doubt end up doing a lot more per turn than you can, since they may end up with more actions per character than you. That's a choice that must be made. The more actions you have, the more things you can do. Technically with 3 actions, you can cover a lot of ground, as you could simply move three times with those three actions. You can never perform more than a single attack action per turn tho, no matter how many actions you have to utilize. Only characters with the “Shooter” ability can take part in Ranged Combat, but both Melee and Ranged combat is resolved in the same manner. It's essentially a comparative roll-off. 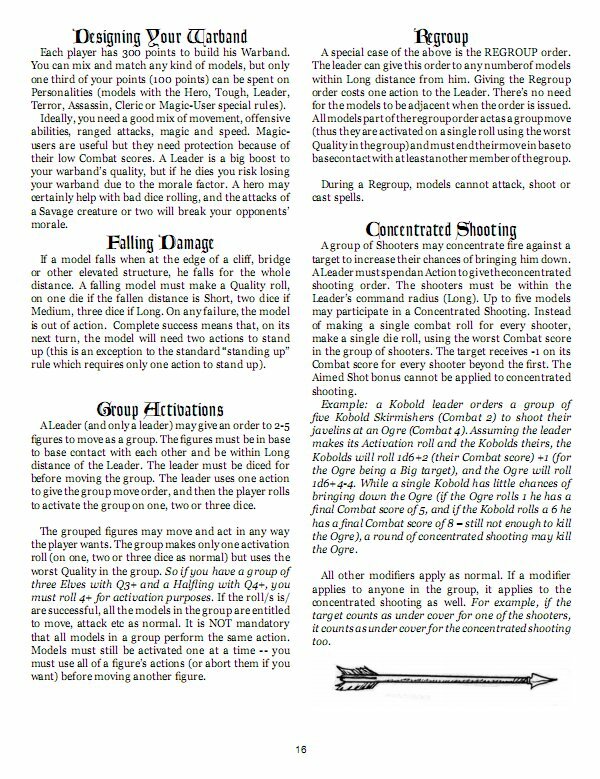 Both parties roll a D6 and add their Combat value to the roll, and any modifiers that would apply. If the attacker ties the defender, nothing happens. If the attacker beats the defenders score with an Even dice roll, then the defender falls to the ground and is knocked down. If the attacker wins with an Odd number roll, then the defender is pushed back one base length away from the attacker. If the attacker doubles the score of the defender, then the defender is killed. If the attacker triples the result, the defender considered Gruesome Killed, and others who witnesses the act may have to take Morale tests. One thing I like about Ranged combat is that while each specific weapon type may define a specific range, you are allowed to fire beyond those ranges, with negative modifiers. For instance if the target is at double the range, you can still take the shot, but at a -2 modifier. The furthest out you can shoot is triple range, at a -4 modifier, and anything beyond that can't be achieved. That I thought was an interesting mechanic. Also both Melee and Ranged combat allow for a modifier for shooting or hitting a model considered Huge and Big Creatures, because since they're larger, they should be easier to hit, and the game reflects this via appropriate modifiers. While there are a handful of modifiers, it's also not a modifier, or chart heavy game either. Magic is handled in a similar way, and you use the activation rolls to also determine how many spell actions you have. Some spells cost 1 or 2 actions, but players must make it clear when rolling for actions, that they plan to use Magic that turn, because failing Magic/Activation rolls can also mean, that you can't use Magic at all the rest of the game, depending on the result. You can also Transfix a foe, pretty much disabling the character, until they can roll appropriately to free themselves. Putting it all together, in play, it's not a terribly difficult game to grasp. I've tinkered around with using a variety of different pieces, and using the pre-made characters found in the back of the book, and found it to be a lot of fun. I like the fact I can use 15mm or 25/28mm figures too, this opens the door to allow players to pickup a shoebox full of miniatures, and use what they have, instead of a hefty initial investment. A handful of even the pre-painted D&D miniatures from Wizards would do the trick for this game. I had fun using some Mantic Games Undead pieces, a variety of Reaper minis, with some Avatars of War pieces mixed in. That's the thing, you can play a game in about 30 minutes, with as little as 4-5 figures per side. I can also see this being a lot of fun using GW Lord of the Rings minis, and playing out some Middle Earth scenarios via SoBaH. The Ganesha Games YahooGroup offers optional stats and rules to achieve this too. I just can't see this being a lot of fun, when attempting to bump it up to large scale combat, without modifying the game somewhat. Due to the activation rolling, and how you could completely loose an entire turn by rolling two failures, before activating all of your units... in a game with 20 or more pieces per side, this could be devastating, and game deciding. Imagine a scenario where you fail, only after being able to activate 2 of your pieces, and now the other side gets lucky, and activates 15 out of 20+ pieces, before loosing the means to activate. In smaller games it's less of a big deal, but as you add more pieces, it changes the game quite a bit. This is where the game can rely too much on luck, and not enough on tactics. Sticking to smaller skirmish size battles is definitely the way to go with Song of Blades and Heroes. 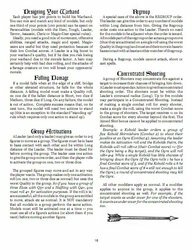 The rest of the rulebook details a simple Campaign system, and a handful of scenarios that you can play out. In Campaign play you can advance your characters, via selecting from a variety of bonus abilities by cashing in 10 victory points per ability. Being able to retain initiative when failing once per game, ignoring a kill once per game, and negating a special ability once per game, are just a few of the abilities available. 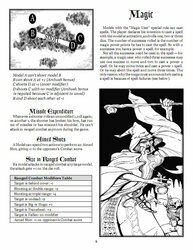 There's also a really nice 2-page FAQ explaining in-depth some of the questions one might have about the game, and this is possible, because this is version 4.3 of the rulebook as reviewed. So they've had time to accumulate, and add a FAQ to the rulebook itself. I think this is a first too, because I don't remember ever seeing a rulebook with a FAQ already built in. Lastly in the back of the book, there is an amazing number of pre-made characters to choose from, over 180 to be exact. 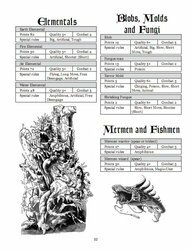 There's an entire full page with pre-made stats for Undead, Elves, Dwarves and Human characters each, and loads of stats for Halflings, Beastlords, Ratmen, Lizardmen, Cat-Folk, Dragons, Gryphons, Elementals, and many more. They cover a lot of ground, and most of the fantasy character stereo-types are there to be utilized. There's even a character creator you can use, which can be found at their YahooGroup , which allows you to create your own from scratch. . Granted, they do make it clear that using this utility doesn't ensure you can't come up with overly cheesy, or gamebreaking characters either, but it's an option nonetheless. Song of Blades and Heroes isn't designed to replace Warhammer Fantasy Battles, nor can it anytime soon, but it wasn't meant to. It's an easier to play, smaller scale skirmish level game in a fantasy setting. That doesn't mean it's not flexible, or that it can't be tactical, it's just not on the same level as WFB. 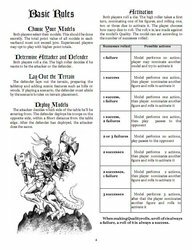 There's also the fact that this game is a fraction of the cost, and is by far the most inexpensive fantasy skirmish game rulebook I've ever reviewed at just $5 for the PDF, and just $12 for a printed version. For being so inexpensive, the rulebook is laid out very well, and learning the game isn't tough at all, due to the brilliant design and layout of the rulebook. There are illustrations throughout, setting the stage, and although this is a black and white affair, it still looks nice. It definitely looks like a skirmish game rulebook, more than a textbook like some other independent publisher products out there. This is a big plus in my book, and it does go to show, that you can have a nice looking rulebook, without wasting space on pointless pictures, and without the need of jacking the price up just to make a presentable offering. 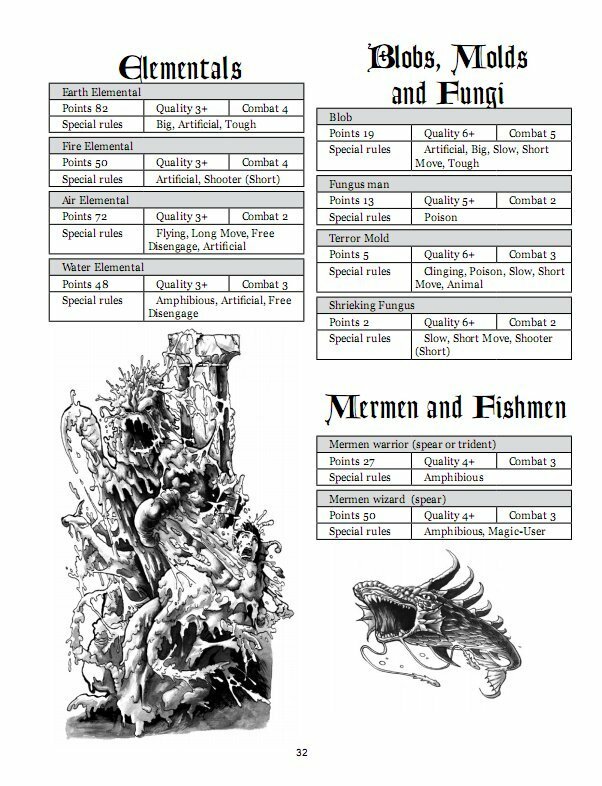 Ganesha Games selling point is that there's not a boat load of bookkeeping, remembering tons of modifiers, and referring to a bunch of charts to play the game. They're right. I'd highly recommend Song of Blades and Heroes as the perfect introductory game for budding younger wargaming enthusiasts too. That's not to say, that it's not in-depth and compelling enough for adults, but due to the simplicity, I think the younger crowd can pickup on this a lot easier than most other skirmish games out there. You will spend more time playing Song of Blades and Heroes, than you will stopping every turn to refer to a 200+ page rulebook to figure out what to do next. That's what I enjoy most about it. I love the fact, that you have the flexibility to create your own characters for it, and that you can use the figures you want to use too. It's more of an open-ended product, than it is a set in stone rule-system. I honestly don't think you could get more for your $5 anywhere else in this industry. If only all skirmish games were this fun, and this easy to jump in and play. The good news is, that this isn't the only game to utilize the SoBaH game engine. This is just the first of many. They also support the game very well with a YahooGroup, and via their website with Free HACK, which is their own PDF publication with optional rules and scenarios for all Ganesha Games products. 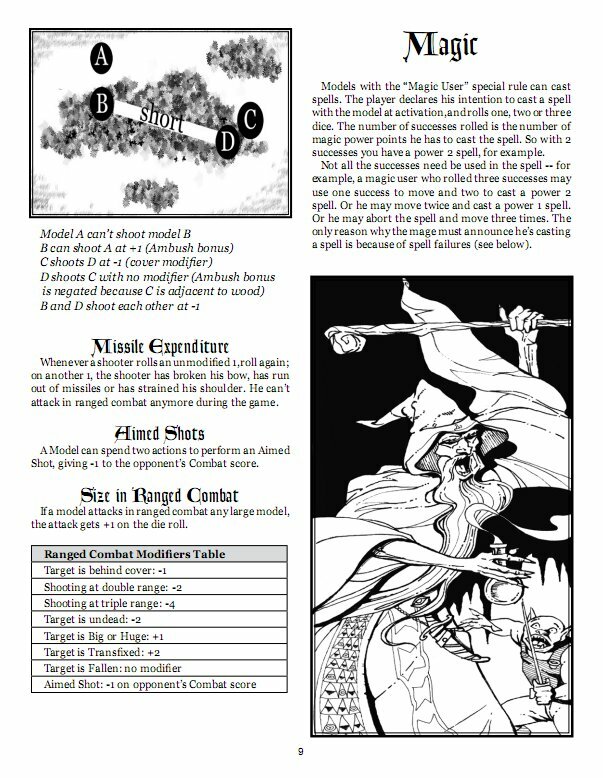 There's actually six expansion products for SoBaH alone, Song of Gold and Darkness (adding dungeon crawling rules), Song of Wind and Water, Song of Deed and Glory (expanded campaign settings), Song of Arthur and Merlin (as the name implies, adds Camelot/Arthur/Merlin scenarios/characters), Song of the Splintered Lands is a child-friendly stand alone set of rules for fury creatures in a fantasy setting, and Song of Fur and Buttons is a kiddie-friendly campaign/bedtime story expansion. That just covers the fantasy setting products. Watch for our reviews of Mutants and Death Ray Guns (their Sci-fi game), and Fear and Faith soon (their horror game offering), both of which are based upon the Song of Blades and Heroes rule-set from Ganesha Games as well.